A simple doll can be easily created using a few materials that can be found around your house or with a few small purchases at a local fabric store. In choosing the materials, use the baby the doll is intended for as inspiration. The doll can be crafted using only basic sewing skills. 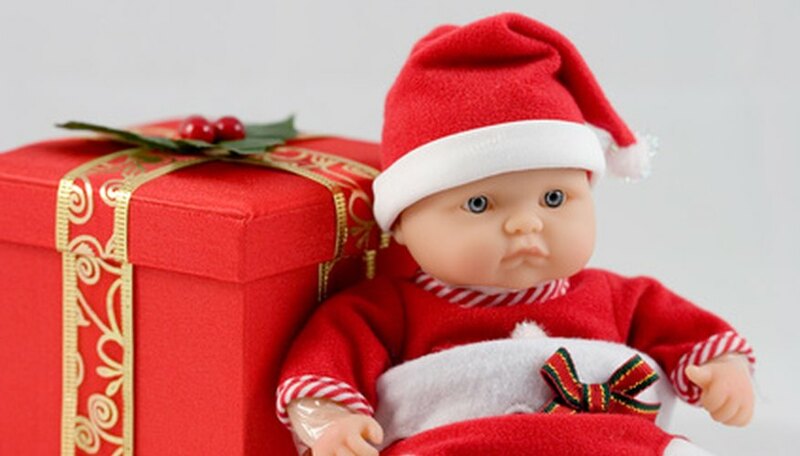 A lifelike baby doll that resembles an actual baby or toddler can become a treasured keepsake as the child grows up. Draw the outline of the doll on the back of a piece of fabric. Once cut out this will create the main body of the doll. Choose the fabric color to coordinate with something the baby would wear. For example, if the baby has a favorite yellow dress she wears often, craft the doll outfit after the dress. Trace the cutout of fabric onto another piece of the same fabric and cut it out. The pieces will now form the front and back of the baby doll's body. Pin the seams of the fabric body together and roll the batting, a form of stuffing that resembles pulled cotton, into an oval shape. Roll another handful of battling into a ball and wrap a flesh colored fabric over it. Tie a section off in the shape of a ball with the excess hanging loose, which will form the head and neck. Tuck the hanging fabric and batting of the neck portion into the top of the body fabric. If necessary, fill the rest of the body with more batting until it is plump and full. Replace the pins by sewing all the seams to secure the batting inside the doll and give the doll a permanent form. Glue yarn to the head for hair if necessary. Choose a color yarn similar to the baby's hair. Draw a face on the doll with a permanent marker. For the project, approximately one yard of the colored fabric for the baby's outfit and 12 inches of the flesh colored fabric should be purchased. You may have excess left over, but in case of errors it is better to have slightly more than necessary on hand. A soft, but durable fabric will work best, especially if the doll is intended as a toy. Try a cotton or jersey fabric as it is easy to work with and soft to handle for the project. Avoid slinkier fabrics like satin or silk as they will be difficult to work with.